Consultations can be scheduled with Dr. Milam at the Vanderbilt Clinic location in Nashville, Tennessee on Monday and Friday. Certain types of tests or procedures are performed at only the Vanderbilt Clinic or only at the Cool Springs locations. Our scheduling staff will work with you to determine the best location for your consultation. Consultations at the Vanderbilt Clinic location occur at the Urologic Surgery suite on the third floor of the Vanderbilt Clinic. Most patients choose to park in the Central Garage on Medical Center Drive across from Vanderbilt Clinic and walk over the bridge to the clinic building. The Urologic Surgery office is conveniently located immediately to the right of the information desk one encounters on the third floor of the Vanderbilt Clinic. If entering the Vanderbilt Clinic on the ground level, take the main elevators to the third floor. Exit into the hallway left past the information booth and the Urologic Surgery practice will be on the right. Both maps below are zoomable. The first map shows The Vanderbilt Clinic location in the greater Nashville Area. Specific driving directions to the Vanderbilt Clinic may be obtained by clicking the "get driving directions" link below. 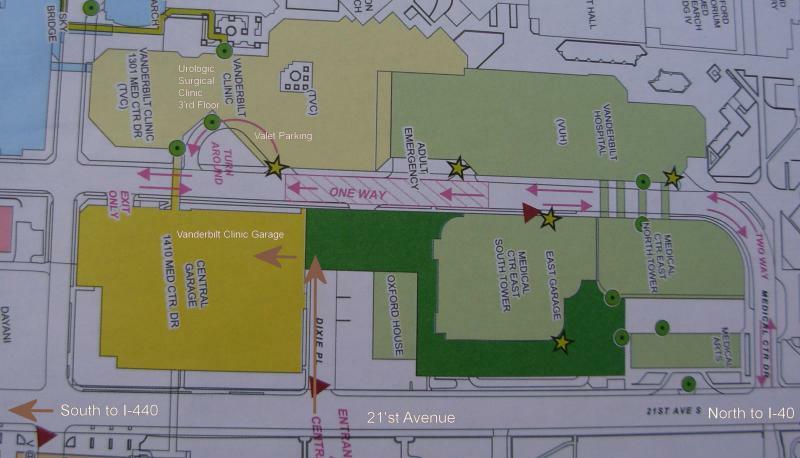 The detailed map at the bottom shows the location of the Central Parking Garage and the Vanderbilt Clinic. Placing the cursor on the map will allow you to zoom in. Please call our receptionists at (615) 322-2880 for help if you cannot locate our office suite. View of Medical Center Drive and the Central Garage on the right. This parking garage is directly across the street from the Vanderbilt Clinic. The elevated bridge shown takes one to the clinic third floor and the information desk near the Urologic Surgery offices.